In my previous post, I showed you ​how to create a Gantt chart in 30 seconds with the Office Timeline+ add-in as pictured below. You can grab the Office Timeline Add-in here if you missed it. And now that you have your information in the Office Timeline+ add-in, the formatting fun begins. And the add-in does just that by getting PowerPoint to apply a wide range of customized formatting to your graphic with JUST A FEW CLICKS of your mouse…things that can otherwise take forever to pull off on your own. Below are 5 (+ a bonus) of my favorite formatting tricks (I have a bunch more, obviously) for working with the Office Timeline+ add-in in PowerPoint. Again, you COULD do these manually, but why bother when the add-in does all of the heavy lifting for you? Just like when working with PowerPoint tables or charts, there are two reasons you ALWAYS want to start with the macro level editing, usually in the Ribbon, for your graphic. Because the add-in holds all of your Gantt chart or timeline information within it, just like a PowerPoint chart or table, there are tools in the Ribbon that will instantly update, format and change the appearance of your graphic faster than you could ever do it yourself. Yes, you can manually format the objects yourself, but why bother when the add-in can do it all for you in seconds? You shouldn’t! On top that, it’s also important to remember the next reason. Just like a table or chart, macro level edits in the Ribbon have a tendency to wipe out your manual editing. So if you start by manually editing elements of your Office Timeline+ graphic, you are likely to lose all of your effort if you later apply a Macro level edit from the Ribbon. 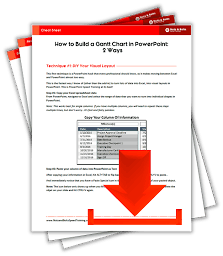 As such, you always want to start in the Ribbon, letting PowerPoint do the heavy lifting for you, before you dive into the nitty gritty of manually formatting your graphic. 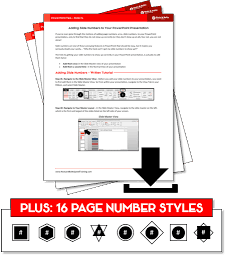 After building your Office Timeline+ graphic (or converting your Excel data into an Office Timeline+ graphic), you are left with a variety of default formatting options that you might not like. For example, by default, the dates start on the right side of your task bars (the text is to the right of each colored rectangle as pictured below) instead of on either side of your task bars. Well instead of adding new shapes to your graphic and manually splitting your text, the Office Timeline+ add-in will do all of the heavy lifting for you. Step #3: Select your position (in this case I’ll choose Split) and your dates will automatically adjust as pictured below. And don’t forget macro level editing reason #1 above. Because your data lives within the graphic itself, you can quickly and easily apply new macro level formatting to all of the dates if you later change your mind about their positioning or formatting. Once you have your dates split, you might also like to reformat them to open up more space in your graphic. Let’s say you want to change the date formatting from ‘Sept 17’ to ‘9/17’. What normally is impossible to do automatically in PowerPoint, the add-in can do for you. Step #3: Select a date formatting style that you like (shorter, longer etc.) and voilà, your date formatting automatically adjusts. Did you realize that the add-in just did the impossible for you?! Outside of working within a chart, formatting your dates in PowerPoint like this is IMPOSSIBLE. 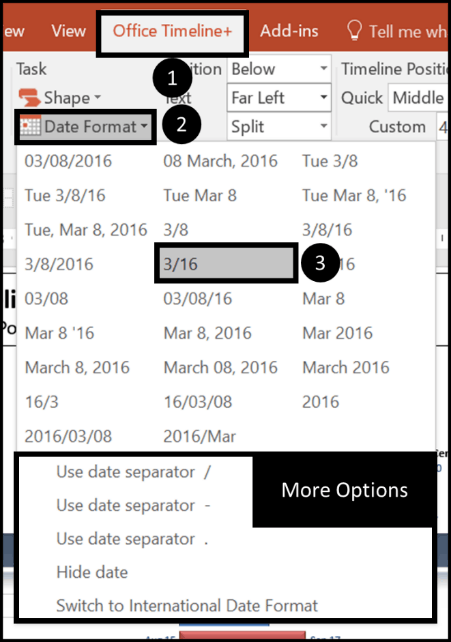 Yes, you can apply date formatting in Excel to a range of cells, but not in PowerPoint. AMAZING! So definitely https://www.officetimeline.com/ use it. Also note in the picture above that you have a variety of additional formatting options at the bottom that you can play around with, giving you even more control over your data formats (very cool). Not only can you format the dates in your Tasks, but you have the same amazing macro level date formatting options for your Milestones too (see picture below) directly in your Office Timeline+ add-in. 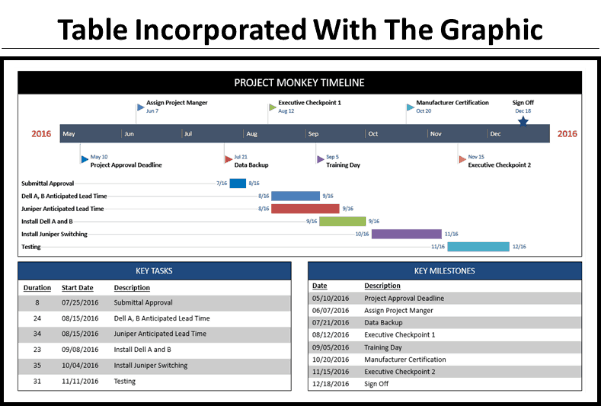 Once you have an Office Timeline+ graphic in your presentation, you also have macro level editing capability over the shapes and positions in just a few clicks. I’ll cover both below and point out a few other wicked little features. Let’s say that you don’t like the default triangles that your graphic starts with (pictured left) and you would prefer to have them pointing out (pictured right). Doing so all automatically turns all of the Milestones into flags, which are re-positioned accordingly. Did we make that look too easy? 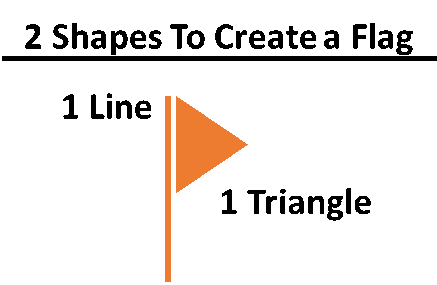 Keep in mind that it normally takes 2 different shapes (1 line and 1 triangle) to build a flag in PowerPoint like that…PLUS you have to put them all into position! Instead, because the data is all held within the Office Timeline+ add-in, it can do all of that heavy lifting for you. And the beauty is that can just as easily change your mind later, choosing a completely different shape and the add-in automatically makes all of the adjustments for you again. As the British would say…brilliant my dear man! 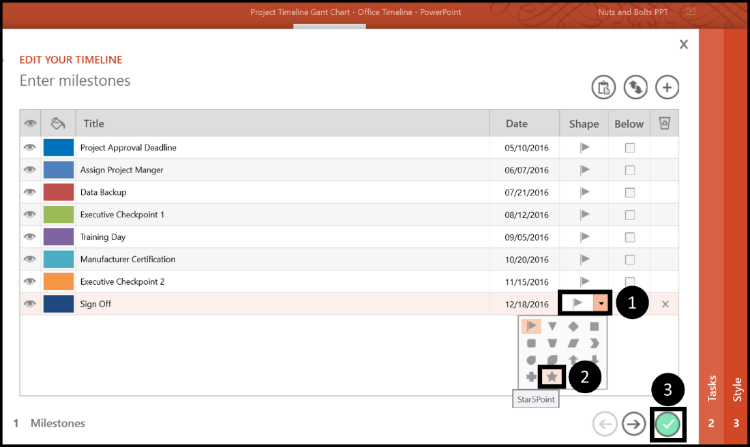 Step #1: Launch the Office Timeline+ Milestone task pane. Again, note that there is a difference here between applying macro level edits to the graphic and applying micro level edits. You don’t want to mix these up. Here we are doing micro editing. Step #2: Select your new milestone shape. Within the dialog box, click the Shape dropdown, and select the specific milestone shape you want to change. For this example, you could change the last milestone in your graphic from a flag to a 5-point star. Selecting okay in the lower right-hand corner, your graphic automatically updates to include the new 5-point star in your graphic. If you have just applied a new milestone shape to a single milestone (as I did in the steps above), opening the milestone dialog box again might prompt the add-in to change all of your shapes to the last manual shape you selected. So you might need to play around with your shapes again. This will be fixed in later issues of the add-in…so I’m told. Using the same Milestone task pan, you can also split your milestones top and bottom along the time band. Step #1: Launch the Milestone dialog box. From the Office Timeline+ tab (1), select the Milestone command (2). Step #2: Choose the alternate milestone command. Within the dialog box, select the double arrow command labeled ‘Alternate milestones above and below the timeband’ in the upper right-hand corner (1). Clicking the button once places check marks along your milestones, moving them below the timeband. Clicking the button again inverses that selection. 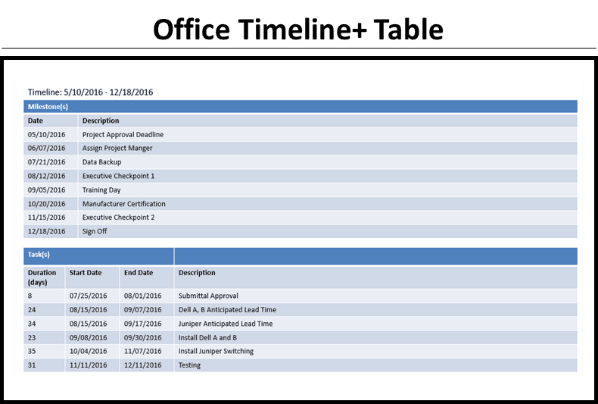 You can alternatively customize which milestone are above or below your time bang by checking and unchecking the boxes. When you are finished, click the checkmark in the lower right-hand corner (2). Clicking finish, the milestones are automatically moved above and below your time band. Again, the add-in does all of the heavy lifting for you! Another way to customize your graphic is to add or remove the horizontal and vertical task lines. Let’s look at this at the Macro and Micro levels. Let’s start by removing the horizontal task lines at the macro level; i.e. getting rid of all of them. Since this is a 100% customizable PowerPoint graphic, you might be tempted to select the task lines manually and delete them, right? Here’s why it’s a bad idea. Manually deleting the task lines and then clicking ‘Accept Changes’ does remove the lines visually from your graphic (as you’ll see below) but does not remove them behind the scenes within the dialog boxes for some reason. Step #1: You have to navigate to the Style dialog box and hide the lines (even though they are not visually there any more) and click Okay to close the dialog box. Step #2: Then you have to navigate to the Style dialog box AGAIN and this time add the lines to your graphic and click Okay. It’s not the end of the world but it can throw you for a loop if you don’t understand what’s going on. See the steps below for how to do this the better way. 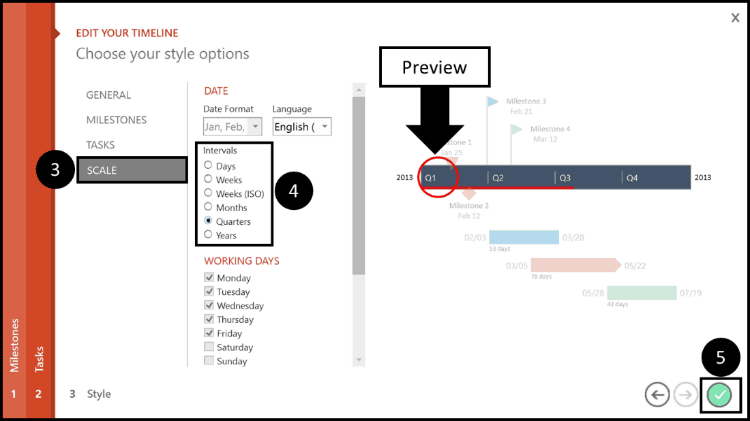 Select the Office Timeline+ tab in your Ribbon (1), and then select the Style command (2). Within the Style dialog box, select the Tasks option on the left (3). Then scroll down to the Connector section of the Style dialog box (4). Here I will tick the Hide circle for the horizontal connectors (you can see on the right a red line indicating what is going to change in the graphic) (5). Click the check-mark in the lower right-hand corner (6). With the horizontal task lines now gone, your graphic looks like this. The Style gallery options add or remove the vertical and horizontal connector lines at the Macro level (as well as other formatting options). Step #1: Select the object within your graphic that you want to apply micro level editing to. 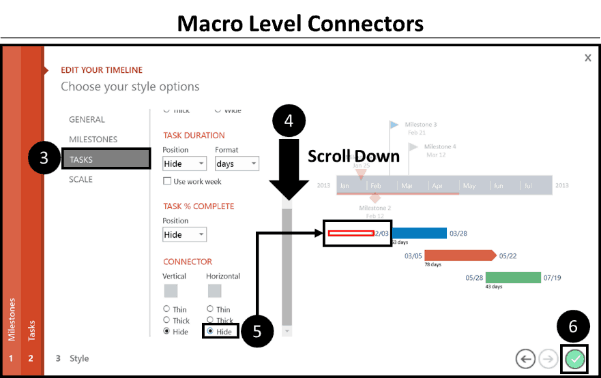 Step #2: Use the Task Pane command in the Office Timeline+ tab in your Ribbon. Using the Task Pane, all of the formatting adjustments will be made only to the object you have selected in your Office Timeline+ graphic. 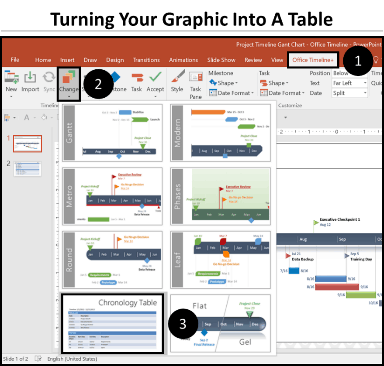 Just like a SmartArt graphic in PowerPoint, once the Office Timeline+ graphic is set, you can flip its layout to a different. You can start with one type of graphic, change your mind, and then switch style. In particular, you can change between the Flat and Gel styles, which is what I’ll focus on here. I personally prefer the Flat look as opposed to the Gel look, but it’s personal preference. Here’s how to quickly flip between the different style formats. Comparing the two styles, there are 3 main formatting differences between the two styles. Changing graphic styles wipes out any manual special effects or other manual formatting adjustments you made to the graphic. For example, if you add a glow effect to the tasks and then flip between the Flat and Gel style, your manually added glow special effect will be removed. The lesson? First pick a style (Flat or Gel) before you make any manual adjustments to the graphic, it will save you time. This really is my all-time favorite Office Timeline+ trick…turning your graphic into a table. Why? Because my biggest concern when I first started playing around with the Office Timeline+ add-in was that if the data in my timeline was changed in PowerPoint, I’d lose the connection to the original data in Excel. Thankfully the Office Timeline+ add-in does this for you in 3 quick clicks. Now with a little bit of PowerPoint Speed Training, you can easily incorporate this table back into your graphic as pictured below. And if the data in your timeline changes again? Simply re-generate a Chronology Table and copy/paste the cells into your nicely formatted table. Boom! Have you ever had a boss, client or colleague who wants you to change the time units of your graphic? 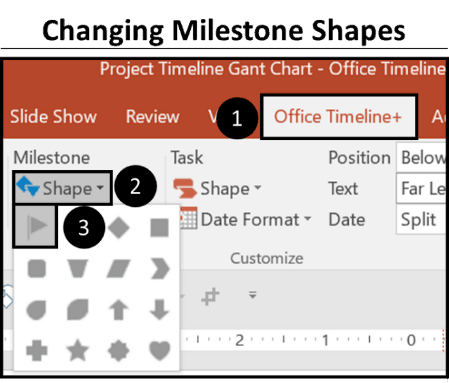 If you build your Gantt chart or timeline manually in PowerPoint this can become a HUGE task…but not with the Office Timeline+ add-in. The add-in can automatically flip the units for you in just a few clicks. Note: You can see a preview of what you have selected in the window on the right. Clicking okay, you can see that the time unit of your graphic is AUTOMATICALLY updated without you having to perform any calculations and/or manually update the chart. So those are 6 of my favorite Office Timeline+ formatting tricks. I have a lot more, but for the sake of this blog post (16 pages long! ), that’s a heck of a good start. Again, the beauty of the Office Timeline+ add-in, is that it stores all of your information within the graphic itself, allowing you to quickly apply macro level formatting adjustments to the pieces of your graphic, without having to jump through a bunch of manual hoops to get the job done. The graphic gets our Speed Training Stamp of Approval, as it gets PowerPoint to do a lot of the heavy lifting for us! It’s never a good use of your time.